To say the above sounds slightly surreal is a bit of an understatement. But, somehow, yesterday evening I attended a dinner in Central London to receive my award from the Guild of Motoring Writers and Jaguar. What is the Sir William Lyons Award? Two weeks ago I opened my Gmail inbox to find an email from Richard Aucock, a motoring journalist and previous winner of the Sir William Lyons award. A read-through at half past six in the morning told me that I had won. Late last year, Carrie Mathieson (@CarrieMathieson) tweeted me a link to the Guild of Motoring Writers competition. I debated about entering, because, honestly, I thought that I would never stand a chance looking at the list of previous recipients. Jonathon Noble, Tim Pollard, Tim Swietochowski – all huge names in the field of journalism and PR. After some consideration, I put pen to paper and formulated a draft. In order to enter, I had to write 1,000 words on how the world of motoring has changed in the past 50 years, as well as submitting an interview that I had carried out with someone from the world of motoring or motorsport. The first task was tough. It took me out of my comfort zone of motorsport, but I enjoyed the challenge nonetheless. The piece took me about a week to write, and I would edit it each day until I was as happy as I would ever be with the final result. I am highly self-critical, so it took a lot of work in order to get the piece to where I wanted it to be! As for the interview, I chose a piece I had done with Tatiana Calderon a month or so previous. Luckily for me, Calderon is a very good speaker, and so made interviewing her a dream! I submitted my pieces, scanned over my entrant form and that was that. The experience was good, I told myself. That, however, brings me to Monday 23rd January 2017. Last night I attended my awards dinner, along with my Dad, at The Edition – a boutique hotel, just off Oxford Street. Upon arriving, we were directed to the private dining room upstairs where guests for the dinner were gathering. Introductions were made and congratulations were given. I had to pinch myself a good few times before I had even sat down! After a champagne reception, I took my seat next to Ken McConomy, Head of PR at Jaguar Land Rover. It is not old news that I aspire to work in PR, so it was brilliant to spend the night talking to him. A real privilege. 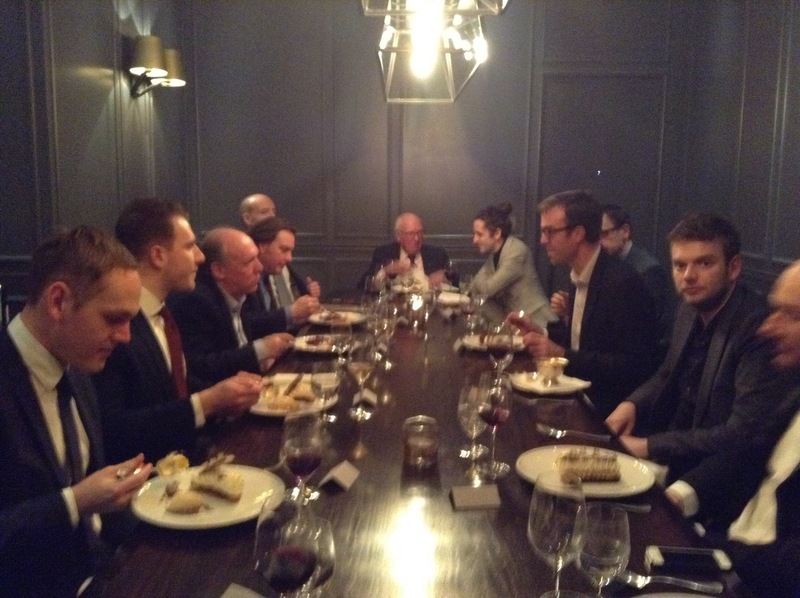 Ian Callum, Head of Design at Jaguar, was also present at the dinner, along with Sir William Lyon’s grandson Michael Quinn and the vice-chairman of the guild, Ray Hutton. Dinner was incredible – like nothing I had ever had before. And, the icing on the cake of the night was certainly getting to ask Ian Callum questions about Jaguar, his career and where he thinks the future of the motor car is headed. The night is one that I shall cherish forever, and I hope that it is just the start of my career in motoring and motorsport. I would like to send out my thanks to the Guild of Motoring Writers and Jaguar for giving me this incredible opportunity.